I’ve written before about how I’d like to create some sort of nest egg for my children but I would also very much like for them to understand money, its value and how to organise their finances a bit better than I did by the time I got to my teens and started earning my own pennies. My first job was in our village shop and I was paid £2 per hour. I collected my wages in a little brown wage envelope and that sixteen pounds seemed like hundreds to me! However after a train into town, a Mac Donalds and a top from Tammy Girl it was gone! I never saved any and had frequently spent it before I earned it as we were allowed our wages on a Tuesday and I worked Thursdays and Saturdays! As soon as I hit eighteen I was out of there and started working at a pub, doing far more hours at a better (but still low) wage. I was still completely naff at managing my money though and once I’d contributed towards the rent at home I just spent it. A few months later I finished my A levels and started working full time so was earning more… at the point I also filled out a credit card application form that had arrived in the post and started using it willy nilly. I bought a ball gown that I never wore, hundreds of clothes, DVDs, dinner and drinks out and taxis to cart me and all my purchases home from the station. What I should have been doing of course is firstly not using a credit card at 18 years old, secondly budgeting my income and thirdly saving a percentage each month and putting it into a savings account. The wonders of hindsight eh? I really do think that money management should be taught in secondary schools! Sam and I have decided that a savings account for each baby needs to be opened, so that any cash gifts at Christmas or Birthdays can be popped into it, along with tops ups from us as and when. We’re Santander 123 account holders already and their Junior Isa would be simple for us to set up. Access is given when the child reaches 18 (something that seems so far away but I know will be here before I know it!) and not before, so there can be no temptation to dip into it. The interest rate is at 2.5% or 3% for Santander Select customers, and you can put as much into it as you like. It would a great way to save a lump sum for a gap year, driving lessons or first car! 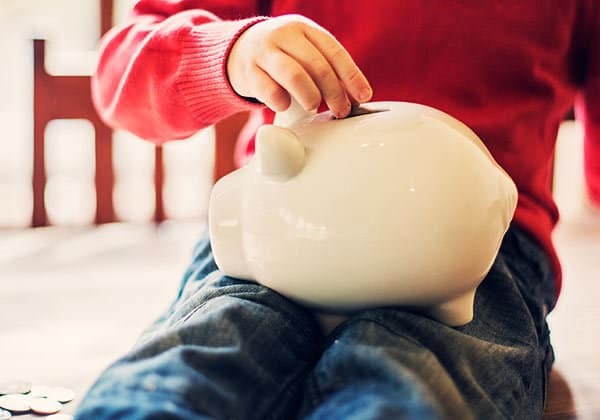 We plan to teach our children about money from an early age, to try and give them a good grounding about how they can manage their income and save for things that matter to them. I plan on using reward charts so that they can ‘earn’ their pocket money, and help them decide what they want to spend their money on, helping them decide how much to save and therefore how long they have to wait to buy it! I also want them to understand a bit about household finances, and the consequences of leaving lights on and windows open, which will obviously be a little further down the line! How do you teach your children about money? Did you have a good relationship with money as you were growing up? This post was written in collaboration with Santander, all words and opinions are my own. Love the sound of the reward chart.. my sister does something similar with her little boy and he’s almost 8 so he seems to understand ‘earning’ things! I was pretty awful with money too growing up, I agree it should be taught moreat school!